The Sources of Psychedelic Art? To discover all features of psychedelic art, we must travel beyond the world of lava-lamp decorations and hallucinogenic trips. This spring also saw the publication of a new book titled “Electrical Banana: Masters of Psychedelic Art,” by Norman Hathaway and Dan Nadel. Featuring an introductory interview by Hathaway with Paul McCartney, the 208-page paperback shines a bright spotlight on psychedelic artists from Europe, Australia, and Japan, some of whom were never comfortable with the term that came to define them. On Sunday April 29, 2012, the authors and graphic artist Gary Panter will be at MoMA PS1 in New York to talk about the book and show a few film clips provided by some of the artists. 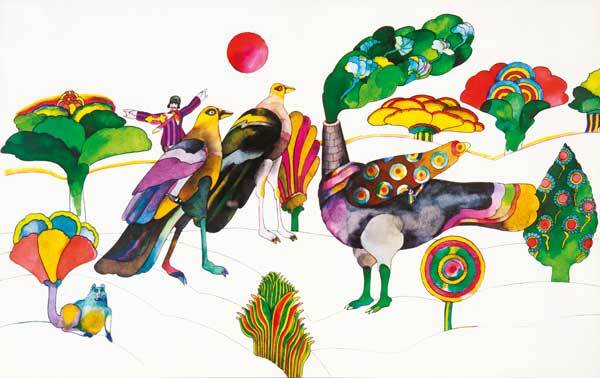 Taking its name from a line in Donovan’s famous tune (McCartney played bass on the recording), “Electrical Banana” features interviews with, and artwork by, seven highly influential artists, such as the late Heinz Edelmann, who conceived the landscapes and characters in the animated feature “Yellow Submarine,” even though he describes himself in the book as being “allergic” to many of the most common tropes of psychedelia. Then there’s Tadanori Yokoo, whose collages took their inspiration, in part, anyway, from traditional kimonos. Believe it or not, some of these artists didn’t even take drugs. The book begins with Heinz Edelmann, a Czech-born graphic designer who was living in Dusseldorf when he got the call to work on “Yellow Submarine,” an animated feature for The Beatles that, much to his chagrin, became his legacy. After all, this was a man who was influenced by artists as diverse as Picasso, Saul Steinberg, and Ben Shahn, and here he was, being asked to draw characters for a film that did not even have a script. 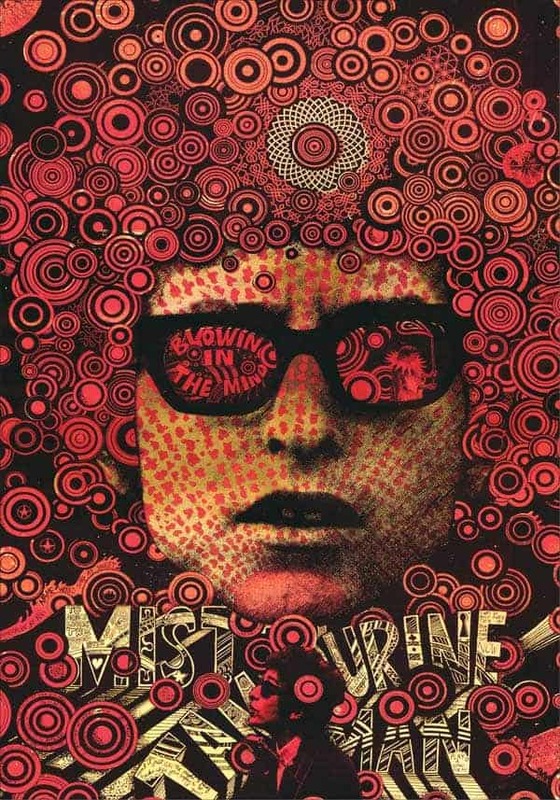 Martin Sharp’s homage to Bob Dylan, “Blowin’ in the Mind,” was silkscreened on foil in 1966. If Edelmann was a reluctant participant in the psychedelic aesthetic (“I don’t like the smell of incense,” he deadpans), the late Australian artist Martin Sharp was an active one, who admired the San Francisco rock-poster artists and cartoonist Robert Crumb in particular. Sharp, who lived in London for a few years before moving back to Australia, even contributed lyrics for “Tales of Brave Ulysses,” which was eventually recorded by Eric Clapton’s band Cream. “I didn’t know who he was,” Sharp tells Hathaway of his first encounter with Clapton. “I learned Eric was a musician, so I told him I’d just written a song. He replied he’d just written some music. So I wrote the lyrics down for him.” The song appears on Cream’s second album, “Disraeli Gears,” whose 1967 cover was drawn freehand by Sharp at its actual size. 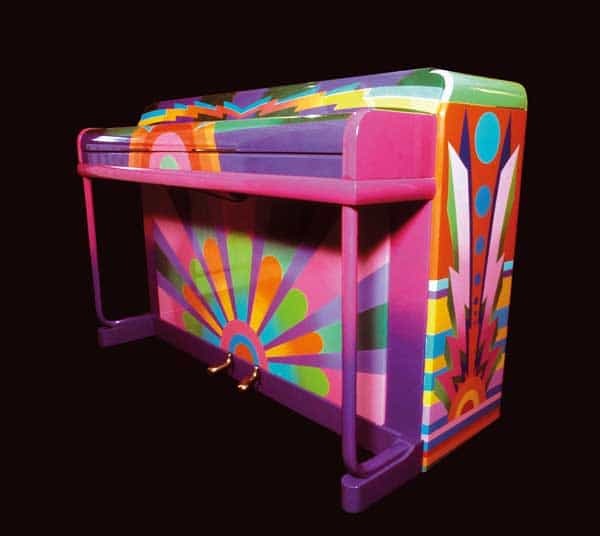 Paul McCartney wrote “Hey Jude” and other hits on a piano painted by the design group Binder, Edwards & Vaughn. Other artists were more like art directors and the set decorators for the pop-music scene. Dudley Edwards was a member of the London design group Binder, Edwards & Vaughn, which made a business of custom-painting dressers, chairs, and other pieces of furniture, treating them, essentially, like three-dimensional canvases. One of the group’s first non-furniture pieces was a 1960 Buick convertible, which eventually was used by the Kinks on an album cover. That led to a commission for Paul McCartney in 1967.